External knowledge search strategies are considered essential for increasing export performance, a crucial goal for small and medium enterprises (SMEs) in a globalised and turbulent environment. SMEs are known to have limited resources, which leads them to choose the export strategy as the best alternative for entering foreign markets. The present study analyses the link between industrial and non-industrial knowledge search strategies and export performance, taking into account absorptive capacity (AC) as a mediating variable. Results from a sample of 222 Spanish exporting SMEs reveal that orientation to collaborate with industrial partners contributes to firms’ AC and export performance. Moreover, AC is found to have a full mediating role between orientation to collaborate with industrial partners and export performance. 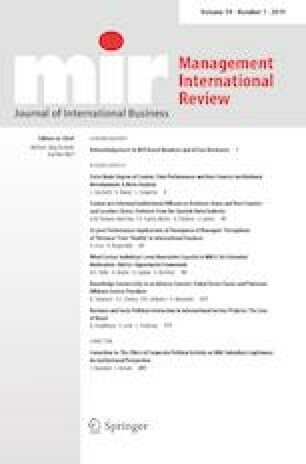 The study makes a novel contribution by applying organisational learning theory to explain how both the strategies firms adopt to access external knowledge and their absorptive capacity affect their export performance. The authors thank the Spanish Ministry of Economics and Competitiveness (Ref. ECO2011-29863 and ECO2015-69704-R) for financial support for this research. We frequently scan the environment for new technologies. We thoroughly observe technological trends. We observe in detail external sources of new technologies. We periodically organise special meetings with external partners to acquire new technologies. Employees regularly approach external institutions to acquire technological knowledge. We often transfer technological knowledge into our firm in response to technology acquisition opportunities. We thoroughly maintain relevant knowledge over time. Employees store technological knowledge for future reference. We communicate relevant knowledge across the units of our firm. When recognising a business opportunity, we can rapidly draw on our existing technological knowledge. We rapidly analyse and interpret changing market demands for our technologies. New opportunities to serve our customers with existing technologies are rapidly understood. We are proficient in transforming technological knowledge into new products. We regularly match new technologies with ideas for new products. We rapidly recognise the usefulness of new technological knowledge for existing knowledge. We regularly apply technologies in new products. We constantly consider how to better exploit technologies. It is well known who can best exploit new technologies in our firm. Government or private non-profit research institutes. Note: All the items were evaluated on an 8-point Likert scale.